Home Danville Yoga Classes TLC-Tender Lovin’ Care Yoga-Rossmoor AND Danville! TLC (Tender Loving Care) Yoga is an ultra-gentle “how-to” foundation yoga program including back care basics, joint-lubricating flows, meditation and breath-work. The premise is: Every body can do yoga. Students report improved posture, balance and ability to consciously modify their movements, alignment and self-talk to build confidence, reduce stress, facilitate disease recovery, and alleviate physical pain. 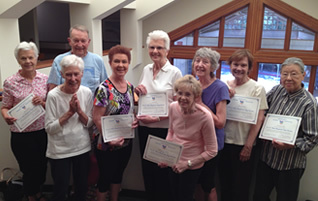 Many continue their practice in Rossmoor classes or at home–with confidence. TLC Yoga helps jump-start or re-start a yoga practice or create a home practice to maximize independent living, energy and ease at any age. Classes are up-beat, compassionate, deeply centering and designed to foster community. Participation is limited to provide intensive individualized support and modifications. The ten-meeting TLC Series runs continuously 11:30 am-12:45 pm in the wheelchair accessible Rossmoor Fitness Shasta Room. Participants report improved posture, breathing, balance, flexibility and awareness to safely modify posture and movement in daily life. Make-up missed classes by dropping into any of Leena’s three weekly drop-in classes during the session. Important: The series is progressive: Each class builds upon the other. Fees: $120 early-bird registration for the first 10 sign-ups or $130 on the day of class. TLC series begins June 12, 2018 at 4:45 pm on Tuesdays at Oak Hill Park Community Center, Danville (see Town of Danville Activity Guide for each season and pricing). Pre-registration is required. For more information and registration, contact Leena St. Michael. Danville, Rossmoor, TLC Yoga, yoga, yoga/meditation.